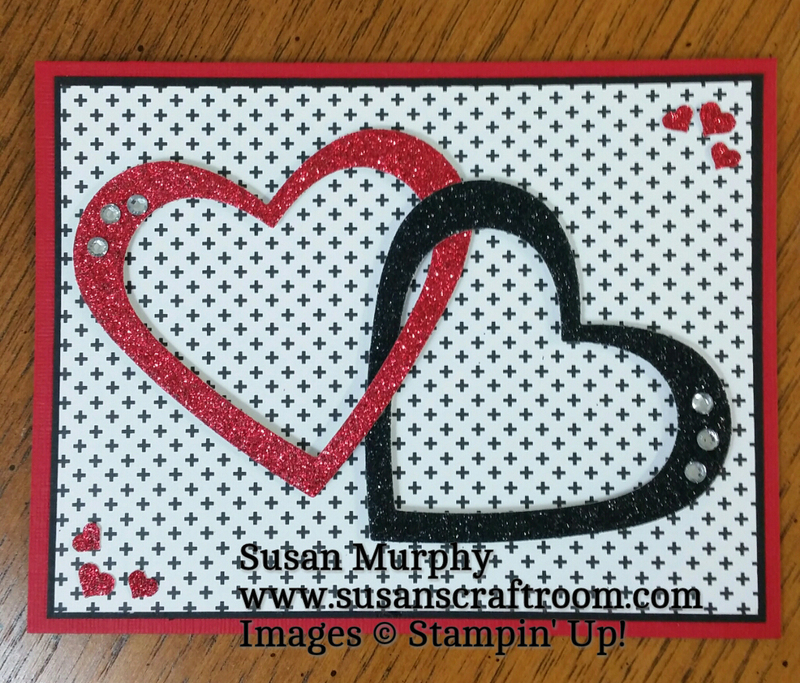 Today's simple card has lots of shimmer & shine with glimmer paper & rhinestones. To make the interlocking hearts, I first cut two hearts using the Sweet & Sassy Framelits. I then cut the Black Glimmer Paper heart, wrapped it over and behind one side of the red glimmer heart. I used a dimensional behind the cut area on the black glimmer heart to reconnect the cut edges. I then added dimensionals behind both the red & black glimmer hearts to adhere them to the card front. The tiny hearts in the corners are made with the Confetti Border Punch and placed on the card using the Fine Tip Glue Pen. Rhinestones on the sides of the glimmer hearts give it the perfect added shine! Below is a complete list of the products used in making the card.